Minnesota Wild There are 1143 products. Get the perfect look to let everyone know you are a stylish Minnesota Wild fan! With eye-catching graphics, this Men's Nate Prosser Minnesota Wild Backer T-Shirt - Green will show everyone that you know how to display your spirit in style. With a comfy tee and that classic look you love, you'll be ready to head anywhere and know that you look your best. Get the perfect look to let everyone know you are a stylish Minnesota Wild fan! 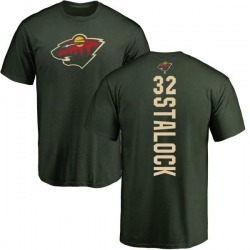 With eye-catching graphics, this Men's Alex Stalock Minnesota Wild Backer T-Shirt - Green will show everyone that you know how to display your spirit in style. With a comfy tee and that classic look you love, you'll be ready to head anywhere and know that you look your best. Get the perfect look to let everyone know you are a stylish Minnesota Wild fan! With eye-catching graphics, this Men's Charlie Coyle Minnesota Wild Backer T-Shirt - Green will show everyone that you know how to display your spirit in style. With a comfy tee and that classic look you love, you'll be ready to head anywhere and know that you look your best. Get the perfect look to let everyone know you are a stylish Minnesota Wild fan! With eye-catching graphics, this Men's Jared Spurgeon Minnesota Wild Backer T-Shirt - Green will show everyone that you know how to display your spirit in style. With a comfy tee and that classic look you love, you'll be ready to head anywhere and know that you look your best. Get the perfect look to let everyone know you are a stylish Minnesota Wild fan! With eye-catching graphics, this Men's Jason Zucker Minnesota Wild Backer T-Shirt - Green will show everyone that you know how to display your spirit in style. With a comfy tee and that classic look you love, you'll be ready to head anywhere and know that you look your best. Get the perfect look to let everyone know you are a stylish Minnesota Wild fan! With eye-catching graphics, this Men's Mikael Granlund Minnesota Wild Backer T-Shirt - Green will show everyone that you know how to display your spirit in style. With a comfy tee and that classic look you love, you'll be ready to head anywhere and know that you look your best. Get the perfect look to let everyone know you are a stylish Minnesota Wild fan! 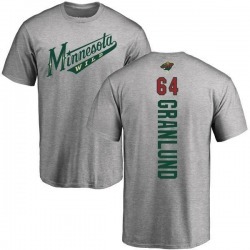 With eye-catching graphics, this Men's Mikael Granlund Minnesota Wild Backer T-Shirt - Ash will show everyone that you know how to display your spirit in style. With a comfy tee and that classic look you love, you'll be ready to head anywhere and know that you look your best. Make sure everyone knows you're the greatest Minnesota Wild fan around! This Youth Charlie Coyle Minnesota Wild Backer T-Shirt - Green is just the Minnesota Wild item to do it. Make sure everyone knows you're the greatest Minnesota Wild fan around! This Youth Jared Spurgeon Minnesota Wild Backer T-Shirt - Green is just the Minnesota Wild item to do it. Make sure everyone knows you're the greatest Minnesota Wild fan around! This Youth Jason Zucker Minnesota Wild Backer T-Shirt - Green is just the Minnesota Wild item to do it. Make sure everyone knows you're the greatest Minnesota Wild fan around! This Youth Nino Niederreiter Minnesota Wild Backer T-Shirt - Green is just the Minnesota Wild item to do it. Get the perfect look to let everyone know you are a stylish Minnesota Wild fan! With eye-catching graphics, this Men's Nate Prosser Minnesota Wild Backer T-Shirt - Ash will show everyone that you know how to display your spirit in style. With a comfy tee and that classic look you love, you'll be ready to head anywhere and know that you look your best.